Rotator cuff repair is a surgery that involves reattaching tendons in the shoulder to the top of the humerus bone. The procedure can be carried out arthroscopically or using a small incision. People with a torn or damaged rotator cuff that hasn't responded to non-surgical treatment methods. Patients who have experienced significant shoulder pain for at least six months. Patients who have a loss of function or chronic weakness in their shoulder. A tear in the tendon that resulted from a recent accident. There is, approximately, a 70% to 80% chance of significant improvement in pain and mobility after rotator cuff repair surgery. Between 10% and 20% of patients still experience significant pain or immobility in the shoulder after the procedure. Patients usually have to have their arm in a sling for between four and six weeks after surgery, although the initial recovery phase can take longer. If the surgeon decides the shoulder is strong enough to be moved, passive exercises may begin four to six weeks after surgery. Active exercises to restore mobility and strength to the shoulder's muscles and tendons can usually begin at around the eight-week mark. It is not unusual for the entire recovery process to last six months. Open repair: 1 to 3 hours. All surgery carries a risk, but the serious risks associated with rotator cuff repair are very low. Surgery that requires general anaesthesia carries a risk. Your level of risk is determined by your medical history. Around 1% of patients experience an infection after surgery. There is a small risk that pain and stiffness will increase after surgery (less than 1%). There is a less than 1% chance of permanent nerve damage in the shoulder after surgery. Listed below you find starting prices for a rotator cuff repair surgery in different countries. 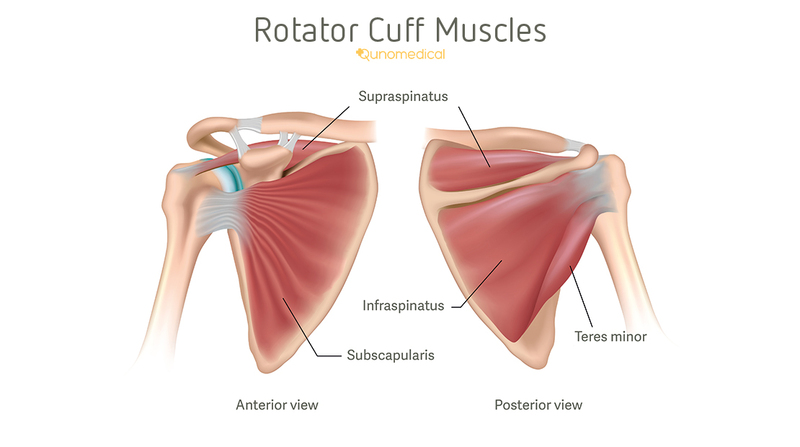 The rotator cuff is a group of 4 muscles (the supraspinatus muscle, the infraspinatus muscle, the teres minor muscle, and the subscapularis muscle) that act to stabilize your shoulder. When you raise your arms, the tendons move to support the movement. But when the tendons rub against the bone, serious pain and immobility can result. Over time, the tendons can become inflamed, worn and susceptible to tears and strains. When physiotherapy, rest, time and possible cortisone injections have failed, surgery is usually the last course of action. Rotator cuff repair surgery is needed when the tendons attached to the bone tear or become detached. This can be done either with a three to five-centimetre incision or arthroscopically via two or more keyhole incisions. Where possible, the surgeon will sew the torn tendon onto the top of the upper arm bone. 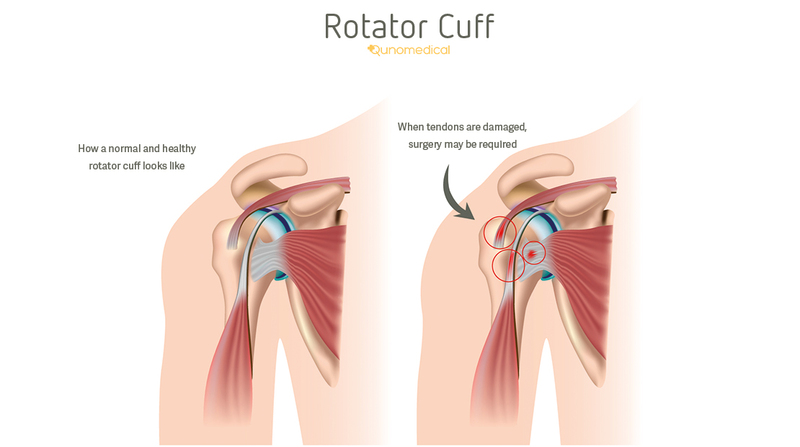 How Does Rotator Cuff Repair Work? Approaches to rotator cuff repair surgery can vary depending on the surgeon and the patient's specific problem. However, regardless of whether the procedure is being carried out invasively or arthroscopically, there are several stages involved. 1. Preparation: Incisions are made, and the surgeon assesses the damage to the tendons. If the procedure is being carried out arthroscopically, the damage is viewed via a scope using a few very small incisions. The surgeon will also decide on exactly where the damaged tendon can be reattached. 2. The procedure: A suture is used to tie two ends of the damaged tendon together. The surgeon may decide to remove or repair any bone spurs with an arthroscope at this stage. The tendons are reattached using small rivets called suture anchors. The tendon is "tied" back to the bone and held in place with the suture anchors, which dissolve naturally over time. The incisions are closed, and a dressing is applied to the wounds. If the surgery is administered using keyhole techniques, the surgeon will take photographs of the internal structures of the shoulder in order to monitor progress. 3. Recovery - Pain management: Regardless of how the surgery went, the patient will usually experience significant pain in the shoulder. The surgeon will discuss pain relief options with the patient, which might include opioids, local anaesthetics, anti-inflammatories and alternative treatments. There is also a chance that a combination of these treatments could be administered. 4. Recovery and rehabilitation: Rehabilitation is every bit as important as the cuff rotator repair itself. The first four to six weeks after surgery usually involve the immobilisation of the shoulder while the tendon heals and bonds with the bone. A sling is worn during this time, but for exactly how long depends on the severity of the injury. Once the surgeon decides it's safe to proceed, a period of passive exercise can begin. At this stage, both the muscles and tendons in the shoulder are relatively weak, so they need to be protected as much as possible. The patient is given a number of minor movements and stretches to carry out to improve the range of motion within the shoulder. Once the surgeon is confident that the repair has been successful - and the muscles and tendons have strengthened - a period of active exercise can begin. A strength and conditioning programme is devised in conjunction with a physiotherapist, which can be painful and mentally challenging. Physiotherapy helps the patient to gradually build strength and mobility over a period of up to three months. However, the process can take longer depending on the severity of the initial injury. Are There Different Types of Rotator Cuff Repair? Open repair: The traditional form of rotator cuff repair surgery requires a large incision - sometimes as large as seven centimetres. The deltoid muscle has to be detached in order to allow the surgeon to gain access to the damaged tendon. This is highly invasive surgery and is only considered for the most serious of injuries or when major reconstruction is required. Arthroscopic repair: A small camera is fed into the shoulder via a very small incision. Pictures from within the joint are viewed on a large monitor, meaning the surgeon doesn't need to remove muscle or cause long-lasting wounds. Specific surgical instruments are inserted into further incisions to perform the necessary repairs. Mini open repair: This is a combination of the open and arthroscopic surgical methods. A small incision of between three and five centimetres long is made through which advanced instruments can be used to repair the tendon. Bone spurs and other structures can be repaired arthroscopically, but the main repair work involves the surgeon having direct access to the tendon. What Should I Expect from a Rotator Cuff Repair? Rotator cuff repair is very rarely a complete cure for pain and mobility issues in the shoulder. While the majority of patients report significant improvements in these areas, the road to recovery can be long and arduous. Pain is managed through a combination of physical support and medication. However, the average recovery time is six months. This can be mentally challenging for the patient as it often takes quite a while before the benefits of surgery become apparent. Pack an overnight bag just in case your initial recovery takes a little longer than expected. Stop eating at least six hours before surgery. Make sure to remove any hazards from your home as your arm mobility will be minimal during the first weeks after surgery. Follow all the advice you're given by surgeons, physiotherapists and other clinicians. From start to finish, this procedure and the recovery process takes six months. You'll be advised on when you can start using your arm, and what exercises you need to do. Remove the sling only when you need to shower or to do prescribed exercises. You may not be able to do overhead lifting for 6-12 months.